The Active Living Alliance for Canadians with a Disability (ALACD) developed a variety of valuable resources that provide insight into inclusive programs, environments and services. Many of these are available at no cost to the general public, while larger projects are available to members. The following terms are suggested to describe people with disabilities. Research shows that proportionately less Canadians with disabilities lead an active lifestyle due to a variety of factors including economic disparity, lack of access to transportation, intimidation, and negative attitudes or lack of knowledge on the part of physical activity providers. For Canadians with a disability, regular physical activity may be even more important than it is for the rest of the population. For a person with a disability, an active lifestyle can open doors to increased health, social inclusion and self-empowerment - doors which might otherwise remain closed. Access to physical activity can eliminate the likelihood of acquiring secondary health conditions like diabetes, high blood pressure or heart disease. Being active builds resiliency and can provide an all-important outlet for a person with a disability. A resource for parents of children and youth with a disability. 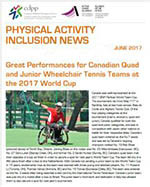 Welcome to these active living stories, that Canadians with disabilities and physical activity leaders have experienced. Share in the recreation, sport and active living stories that others have made their passion in their own lives. Developing a repertoire of physical literacy skills will guide you through fitness and attitudinal changes in your life. Embrace it! Diabetes is a condition in which the body cannot produce an important hormone called insulin. Insulin is produced in the pancreas. People with diabetes do not make enough insulin in their bodies or they have trouble using the insulin that their bodies produce. When your body lacks insulin or you cannot properly use the insulin your body does produce, you can develop many serious health conditions. We are pleased to offer to members of the Active Living Alliance for Canadians with a Disability (ALACD) exclusive access to our most popular resources, programs and training materials. This is a 2-hour training program that covers the essentials of providing inclusive environments, programs and services. This resource is an ideal means to sensitize program participants to provide a welcoming, inclusive service. This program is for members only. If you are a program or service provider, whether through a municipality, school, club or other type of organization, you know how important it is to be inclusive to all members of your community and to promote healthy, active living for everyone. However, including persons with a disability can sometimes seem challenging. All Abilities Welcome is a resource to help you meet the challenge. This resource is an ideal means to sensitize program participants to provide a welcoming, inclusive service. This program is for members only. This resource is an ideal means to sensitize program participants to provide a welcoming, inclusive service. This program is for members only. Almost any type of physical activity or game can be adapted to meet the needs of individuals with varying levels of ability. Adapting an activity to promote inclusion only requires an open mind, creativity, flexibility, and collaboration with those participating. This program is for members only.